Cloves are everywhere you look, in Gilroy. HAPPY 34 YEARS: When you live in a state that is as produce-plentiful as California, you come across a lot of weekend parties that spotlight a particular area's particular agricultural offering. Meaning the Golden State basically has some single-food party going on every weekend of the year, practically, and some items get multiple bashes in multiple towns. (We're looking at you, avocados and strawberries.) But by far one of the most famous of the Golden State food festivals, here and everywhere, is preparing to roll in Gilroy over the July 27-29 weekend. Want a few hints? Well, Gilroy is the giveaway. This is also a food that needs to be released from a larger head, and then peeled, and then smashed, minced, or pressed. (Yep, some of us eat 'em whole, without the smashing part, but eating these things whole is for experienced users, only.) We're talking garlic, of course, and the famous Gilroy Garlic Festival is about to mark its 34th year. ABOUT THE FEST: One? It's warm. 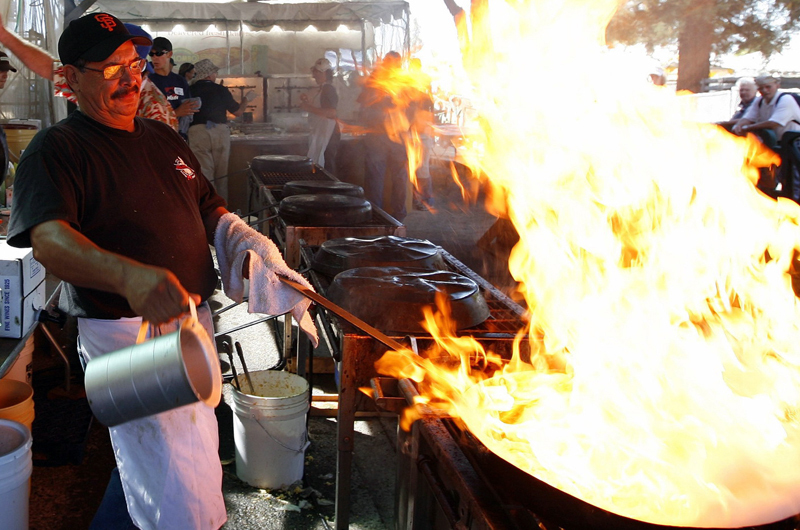 It's Gilroy in the summertime, so temps can get as sizzly as the stuff frying up in the pans. Two? That doesn't stop some guy dressing as a clove of garlic. We can't fully enjoy the festival if we haven't had our photo taken with that guy. Three? The garlic will come in all forms. Yep, there are a lot of pastas and breads, but then there's the garlic ice cream and our favorite, the deep-fried garlic cloves with dipping sauce. (Split them with a friend; trust us, you think you can eat them all but that dream is too big.) It's a fun fest to hit at least once, especially given its fame and especially if you're really, really into garlic. Garlic lovers are special, aren't they? More obsessive than people who merely like this one food or this other edible. There are cook-offs and competitions and entertainment, too, so check out the whole scene. Again, it will be warm. Hydrate. Wear shorts. And look for the guy dressed like the giant, human-sized clove -- he's sweet inside his spicy get-up.